Anyone who knows me knows that I love Beth Moore books and studies. My goal is to read all of her books and complete all of her studies. Her material is so easy to understand and applicable to life. 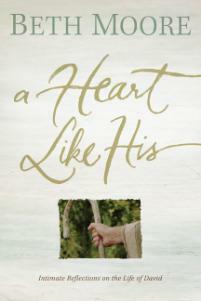 She has not disappointed me with A Heart Like His, the story of David. I had completed her study on David entitled Anointed, Transformed, Redeemed and came away with a better understanding of the life of David. However, A Heart Like His helped me to relate the events and lessons from David’s life to my own life. David was a shepherd, the youngest son of Jesse, and the anointed king but before all of that he was a man – a man with fleshly desires, a man with free will, a fallen man. David is the man next door to you. David is the mayor of your town. David is you. The one thing that sets David apart from many is that he was humble and chose to align his heart with God in such a manner that even in the dire condition of his sin David cried out to God with repentance and love. David loved and served in a manner that showed how his heart aligned with God’s. David also understood that he was unable to stand alone in life but must always stand with God. Therefore God was not just his trump card in hard times – he was his Personal Advisor in daily decisions. I try to live like David, but I tend to try to “do it myself.” Most of the time all that gets me is lost, crying, and eventually facedown before my God. I received this ebook free for review from netgalley.com.